classic vegan ice cream cakes in los angeles by carvel 90210! 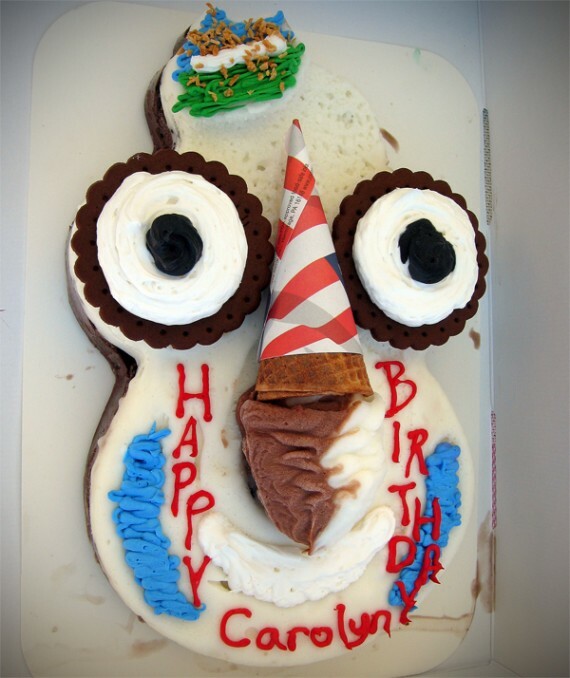 this is a vegan classic cookie puss that carolyn from the healthy voyager got for her birthday. i’m totally jealous. vegan ice cream cakes are available from the beverly hills location only, so give them a call or send them an email to order your cake. they responded to my email almost immediately! FREE VEGAN SOFT SERVE & ICE CREAM CAKE THIS WEEK! EXTENDED! 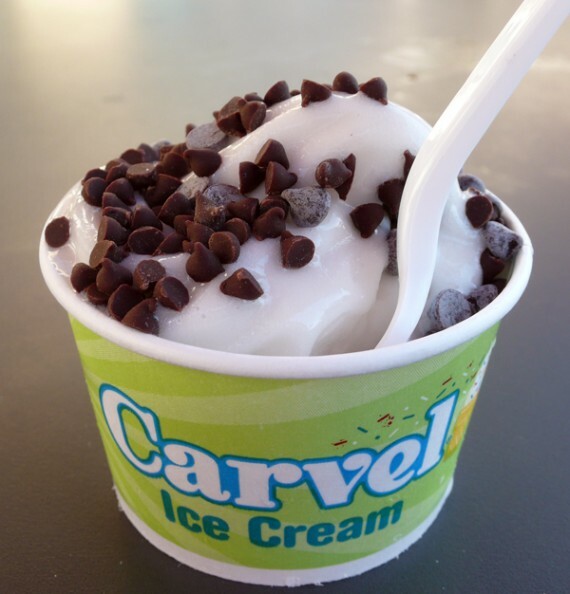 UPDATE: i just found out carvel has extended their FREE ICE CREAM giveaway! 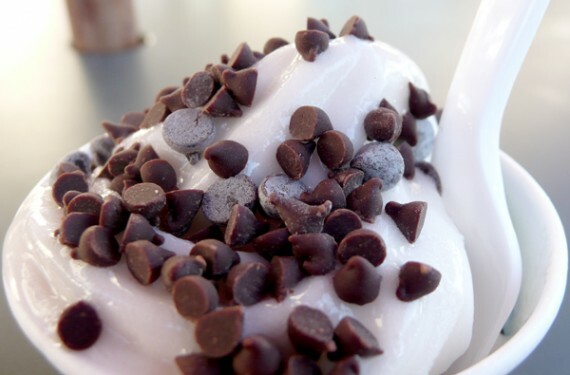 they open officially this weekend, but are giving out free vegan samples from 11am-4pm until FRIDAY 1/29! get over there! yes, FREE VEGAN SOFT SERVE AND ICE CREAM CAKE!! do i have your attention now? 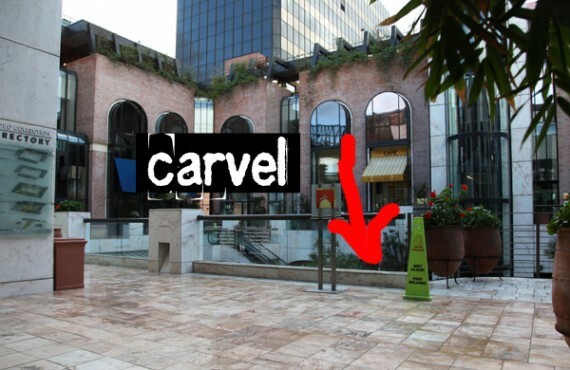 remember carvel los angeles, the place i blogged about back in the summertime that was offering vegan soft serve? well they have been in the process of relocating to beverly hills, and construction is finally complete! they aren’t officially open for business yet, but AS OF NOW monday through friday from 11am-4pm they are handing out free samples and introducing their new vegan line. i heard this info from a pre-recorded message when i called their location at 310-278-5411 (try it for yourself! ), and it sounded way too good to be true. lo and behold, i showed up today at around 1pm and was greeted by 3 friendly staff members who wouldn’t let me pay for my ice cream. they gave me some vegan vanilla soft serve with nuts (pictured above), as well as a slice of chocolate ice cream cake. 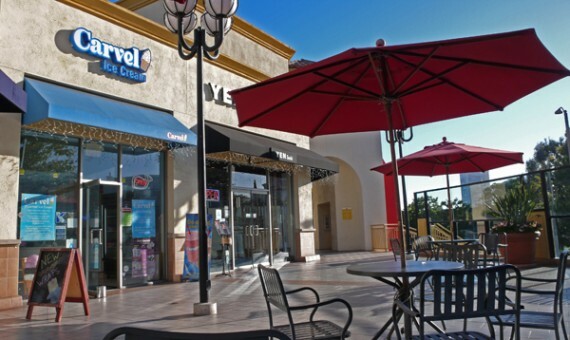 they also explained that when they open, the carvel beverly hills will be half vegan with even more animal-free flavors and toppings (including chocolate sauce)! woooo! 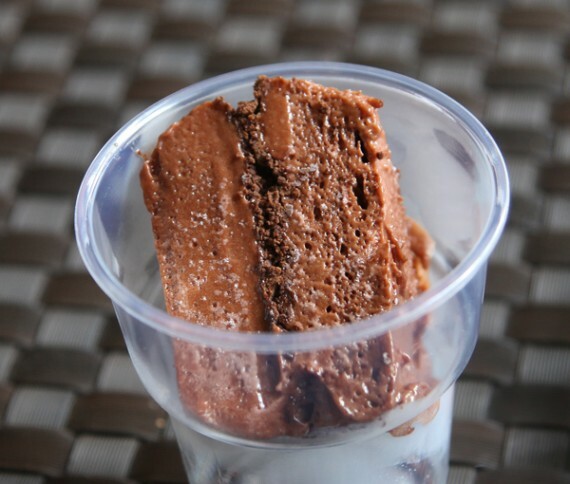 free vegan ice cream cake sample! the ice cream cake and soft serve were both great! they were really sweet, but also very healthy tasting, and not overly rich. 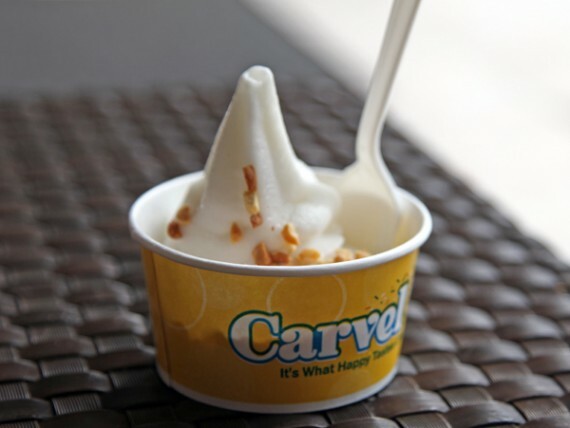 back at the old location, carvel was using temptation soft serve from one of our favorite companies, chicago soy dairy. not sure if this stuff was temptation as well, but it was damn good. i can’t wait until these guys open for real, because i am totally gonna have them make me a vegan cookie puss! i highly encourage you to do whatever you can to get to beverly hills this week and hit up carvel for some FREE ICE CREAM! dude, soft serve and cake, at no charge?!!?!?!? what could possibly be better than that? they are located on rodeo drive, in the rodeo collection….on the very bottom level, by the valets. i parked north for super cheap in the metered parking lot at santa monica blvd and rodeo drive. if you enter from rodeo, this is what it looks like, and just take the escalators to the bottom level. PS: if you do go this week and take advantage of the free stuff, leave a nice tip! i, stupidly, had no cash on me today….so if you could throw in an extra buck on my behalf i’d be totally grateful!